On our evening stroll through Heidelberg, we lead you through the enchanting Old Town shortly before the onset of dusk. In Heidelberg, the streets and lanes you walk through today are in the same place as they were when they were constructed in the 13th century. Indeed, when the city was destroyed towards the end of the 17th century during the Palatinate succession war, it was rebuilt in baroque style, but on the original ground constructs from the Middle Ages. Stand on the Alte Brücke (Old Bridge) to let your eyes wander over the Old Town and the castle ruins which have become known internationally, primarily due to the pictures of the English landscape painter William Turner. During your evening stroll, be sure to enjoy Heidelberg from the perspective which has inspired many painters and poets for centuries. Beyond this, we will also show you the Kornmarkt (Corn Market) with the Madonna statue, the Rathaus (Town Hall), the Church of the Holy Spirit, which was built on the site of the famous Bibliotheca Palatina (Palatinate Library), but also the town’s oldest surviving Renaissance building, namely the Haus zum Ritter (House to the Knight), which already fascinated poets such as Victor Hugo. While on your way through Heidelberg’s narrow lanes, which reveal, again and again, unanticipated views into picturesque back yards, you will also pass by the Studentenkarzer (Student Jail). This was where students had to sit out their punishments for minor offences, so this jail is an impressive testimony to the animated student life of past times. 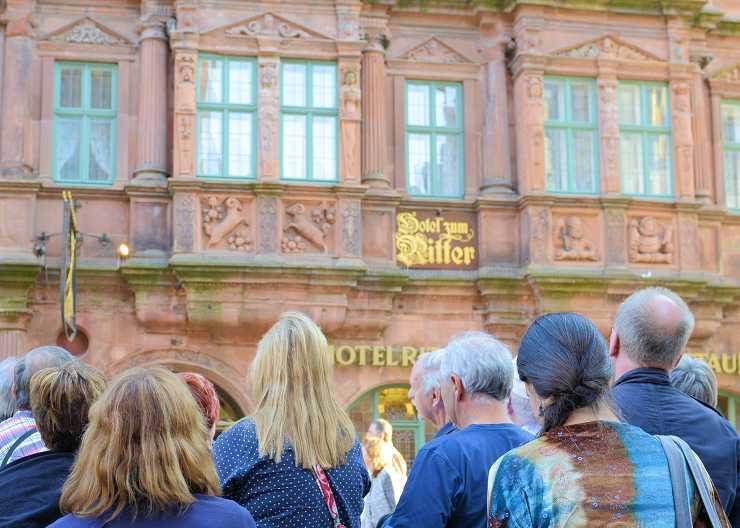 While you are acquiring interesting knowledge related to the city’s history during your evening stroll, you will also experience the special Heidelberg flair of the Neckar: numerous outdoor pubs and strollers passing by, enjoying Heidelberg’s renowned evening atmosphere. You can cancel your reservation or have it changed. If you cancel your reservation at least one week before the date agreed for your evening stroll through Heidelberg, there will be no additional charge. If you cancel it less than one week but at least one day before the agreed date, we will charge you 50 % of the agreed fee. If you cancel on the day of the tour or do not appear at the agreed time and place, we will charge you the entire agreed fee. 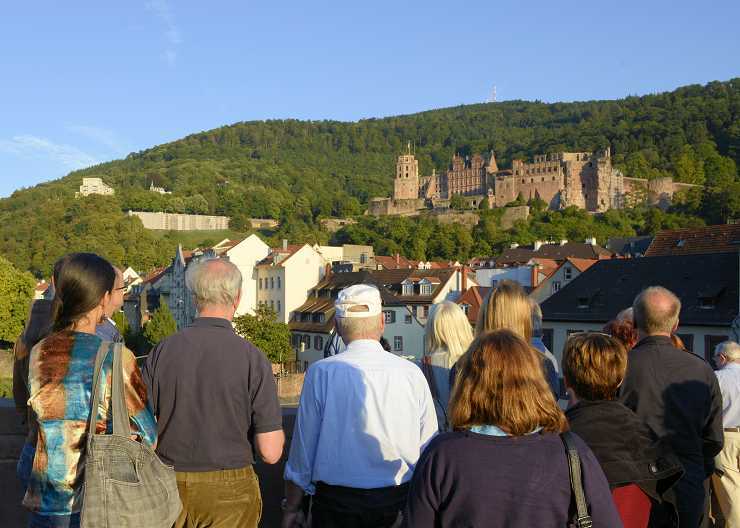 Changes can be made up to five days before your evening stroll through Heidelberg at no additional charge. If you wish to change the time and/or meeting place less than five days before the tour, we will charge you 20.00 € for this change. Then, the time of day may only be changed by at most two hours (either way).